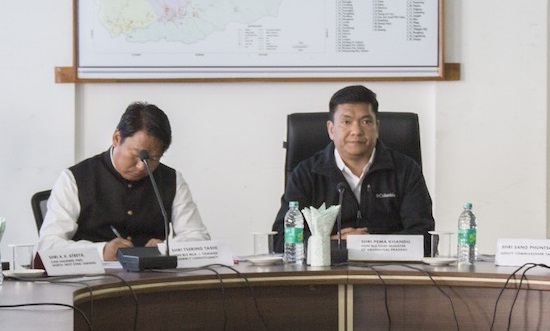 Arunachal Pradesh Chief Minister Pema Khandu on Tuesday held a review meeting with all heads of departments and other officers to discuss the status of all centrally sponsored schemes being implemented in the Tawang district. He also reviewed all the departmental activities. Speaking on the occasion, the Chief Minister said the bureaucrats are the main backbone of any government and they being permanent part of it have great responsibility in taking the state ahead. He requested them to play active role in creating awareness of the people on all flagships programmes and urged them to educate themselves first to disseminate information effectively. He said the centre under the leadership of Prime Minister Narendra Modi has been helpful towards the state on every occasion and informed that construction of tunnel bypassing Sela Pass will have its tender floated this year. He also informed that state’s medical college will begin its session from this year with seat intake of 50. Khandu said the state government is working earnestly to make development a pan Arunachal movement by decentralizing all the activities of the government. The Deputy Commissioners are being given more powers and roles in formulation of schemes and will also have the final authority on deciding on disbursing of loans such as on Deen Dayal Swavalamban Yojana. “The Swavalamban Yojana has faced setback due to cumbersome formalities. Therefore instead of following the usual procedure of it being sent for approval at the state level, the DCs have been given the authority to make the final call,” Khandu said. He said the shorter route will enable more unemployed youths to take part in the Swavalamban Yojana scheme. The CM further informed that the DCs have also been empowered to decide on proposals under SIDF along with the local MLAs and other elected members. He also informed that the next cabinet to be held will finalize on formation of Service Selection Board to recruit group C posts under every directorates and departments. The board will also conduct recruitment for posts at district level but will allow applications only from that district. The CM said due to bad recruitment practices many corrupt and incompetent ones have been employed in the government rendering the system weak and ineffective. By bringing reforms in the recruitment process, he hoped that the work culture in the system would be improved. Tawang MLA Tsering Tashi and Tawang DC Sang Phuntsok also spoke on the occasion.